Announcement Flat rate shipping Australia wide. Worldwide shipping available! Flat rate shipping Australia wide. Worldwide shipping available! Great item thank you. Will shop here again. Just what I needed, packaged beautifully and shipped very quickly. I have an older Big Mama loom, and these legs are a perfect snug fit. The legs are sturdy and hold the loom in position with very little wobbling. Another wonderful product from The Unusual Pear, I highly recommend this shop. The medium Moon Loom with a completed weaving! Mini Weaving on the Beginner Loom! My name is Rainie Owen and I am the weaver and loom designer behind The Unusual Pear. I run my studio and workshop from home in Newcastle, Australia; where I live with my husband Beynon and two kids, Poppy and Louis. I caught the weaving bug in 2014 when I was pregnant with my daughter Poppy. The therapeutic nature of weaving was a much needed creative outlet for me during my last weeks of pregnancy and has flourished into a wonderful daily ritual. Every spare moment I have, I weave. After a few months of weaving, I began designing and prototyping my own range of weaving looms late 2014 and in February 2015, I released my first range of beginner-friendly and affordable weaving looms to the market. The Unusual Pear weaving looms and tools are made from beautiful FSC certified bamboo and each and every piece is sanded by hand before heading out into the world. My weaving looms and tools are my original designs and have been tried and tested for years. When purchasing from The Unusual Pear, you are purchasing an original design, an Australian made and owned product and supporting a small creative business. The Unusual Pear is always evolving with my ideas and passion to rethink designs, making old crafts fresh, exciting and interesting again. I feel so lucky to have the honour of helping people find their creative passion with weaving. Weaving is the type of craft that will literally change your life. It's one of those healthy addictions that is actually good for your spirit and mind. If you're anything like me, you need to keep your hands busy at all times but don't have the brain capacity to keep up with counting stitches and following instructions, then weaving is the craft for you! I'm the gal who's getting you addicted to weaving! Sue and Ray have been developing and making this rug yarn for the last 18 years. They have their own beautiful Alpacas which they shear to create this yarn. I have been working with them for a few months now to create my own colour blends. This yarn is only sold online through The Unusual Pear. Lynds laser cuts the weaving looms and tools that I design from FSC certified bamboo. Once cut, they take a short drive to my home in Newcastle where my husband and I give them some TLC and sand out all those splinters and smooth out all the edges. Please ensure you read my shop policies before making a purchase. Once you place your order you are agreeing to these policies. Contact me if you have any questions! - Please choose carefully and read the descriptions for each item you would like to purchase. - The Unusual Pear will refund or exchange most* items within 7 days of delivery. - If your item(s) were damaged in transit I will require you to send photographs of the damaged item(s) and also photographs of the packaging that they arrived in; Either a replacement or refund will be granted for the item(s) damaged in transit. Please make contact within 7 days of receiving your order. - If you received the wrong item in the mail, my sincerest apologies! Please contact me ASAP! ******Buyers are required to pay for all shipping costs if returning or exchanging items. - If for any reason you have to cancel your place in the workshop, a minimum of two weeks notice is required for a refund. - Any cancellations within two weeks of the workshop date will not be granted a refund but I will happily send the materials you would have received at the workshop to your home address. Your order will not be shipped until payment has been received. The Unusual Pear WILL NOT refund or replace lost/stolen/sent to the wrong address mail items. It is the responsibility of the buyer to pay for signature on delivery if so required. Your order will be shipped via Australia Post in 3-5 business days once payment has been received and will likely arrive within 5 business days once shipped. Tracking information is not provided if your package sends flat (Small and Medium Loom Only options, Tiny Looms and all Weaving Tools). YOU MUST PAY FOR SIGNATURE ON DELIVERY IF REQUIRED. This is an option at the checkout when you order. Your order will be shipped via Australia Post in 3-5 business days once payment has been received and will likely arrive within 10-15 business days once shipped. Please note that your order is being sent from Australia. Very rarely, packages can be held in customs for routine checking and if this happens, can take up to 6 weeks to arrive. YOU MUST PAY FOR TRACKING INFORMATION IF REQUIRED. This is an option at the checkout when you order. How do I find the resources to use your looms? www.theunusualpear.com - I have videos, photographs and written instructions for my weaving supplies. What size loom should I order? The size of the loom you order is really just a matter of personal preference. You can choose to warp and weave the whole width of the loom, maximising your weaving area or you may choose to only warp and weave a section of the loom to create a smaller piece. You can add tassels to create longer lengths to your pieces. The best value for money is my Big Mama Loom as it is the biggest in my range. What should I use to warp my loom? Warp is the lengthwise threads of the weaving and the foundation for your woven piece. You want to use a strong thread that will not break. The most common type of warp is cotton. I have a great natural cotton warp in my shop which is strong and perfect for warping. It's 200g so it will get you through a ton of weavings before you would need to order more! You can use all sorts of thread for warping and any colour you like to create interest in your piece. 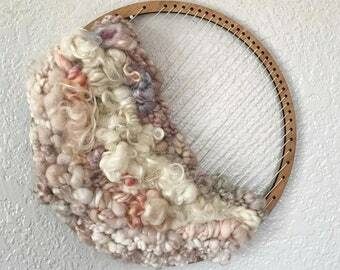 What sort of yarn and materials can I weave with? The wonderful thing about weaving is that you can use almost anything as your weft (the crosswise threads of the weaving). The yarn that I sell in my shop are hand dyed and/or hand spun Australian wool yarns. I choose to include Australian made wool yarns because I believe in supporting local businesses and I also know and understand the impacts that some other yarns have on the environment (nylon, acrylic etc). Where can I find more pictures and inspiration for weavings? You can head on over to Instagram to find a motherload of inspiration by searching popular hashtags such as #weaving #woven #wovenwallhanging #weave #weaverfever #getyourweaveon #weaversofig #weaversofinstagram #handwoven #weavingloom and so on.